Almost any man can father a child but being a dad in a child’s life is monumental! More than 70 countries, from Argentina to Zambia will celebrate and honor fathers this month for Father’s Day. Yet, we celebrate fathers in a culture of fatherlessness! At Anthem Strong Families our goal is to demonstrate how communities thrive when fathers are actively engaged in their children’s lives. We witness the brokenness that occurs when fathers are spectators rather than active participants with their children and families. There is resounding evidence that fathers influence their children in unique and important ways that mothers do not. Fathers are critical to the success of their children from helping to form cognitive abilities and educational achievement to psychological well-being and social behavior. Actively engaged fathers contribute to decreasing delinquency and even economic advantage in low income families. We have learned that a family structure where the committed father is present in the home provides more stability and creates an environment of support even through difficult times. While we celebrate Father’s Day we are living in a culture where fatherlessness and father absenteeism in the home is considered a crisis by social scientists and even some health experts. There is also a direct link to poverty and homes where the father is absent. The City of Dallas has one of the highest concentrations of poverty in the nation – 24.4 percent, versus 14.5 percent nationally. In Dallas County approximately 180,000 children are growing up in homes with absent fathers. According to the U.S. Census Bureau the statistics don’t fare any better across the country. More than 24 million children in America – one out of every three live in biological father-absent homes. The cost to Texas in dollars for broken lives and families is astronomical and growing exponentially—more than $3 Billion each year. We have one of the most integrated Fatherhood programs in the state. In 2015 we received a federal grant to help us deliver hope to fathers by continuing the pioneering and award-winning TYRO Champion Dads Program. TYRO means, “A novice, an apprentice, someone learning something new, a warrior or founding father.” We’ve expanded the term to mean a man who is willing to war—to fight—for his family. Our goal is to help fathers be champions because we believe fathers are just that. We equip and encourage dads trapped in generational cycles of poverty, welfare dependency, crime, economic crisis and inadequate employment. Our definition of fathers also includes are non-custodial and custodial single fathers, veterans, refugees and immigrants. We provide robust training for dads including: anger management and conflict resolution, how to navigate the child support system, boot camps for new dads and how to view grief and loss. Former junior high school principal, TEDx alum and President of Strong Fathers-Strong Families, LLC, J. Michael Hall recently coined the phrase, “FatherFULLness.” He asserts that the discourse must change from one of hopeless statistics to one of promise. 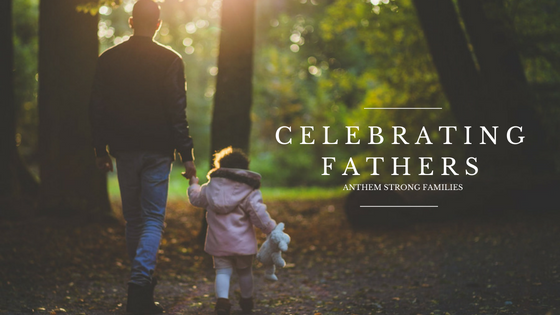 At Anthem we aim to change the narrative by providing fathers with dynamic tools to understand and employ their greatest assets which are themselves. There is hope and strength in recognizing that fathers are critical to our society. We’ve witnessed the long-term effects of innovative programs and approaches that provide support, education, and empowerment to men to be warriors for their lives, marriages and children. The data is clear; healthy families create healthy communities and fathers are the cornerstone. For more information about our programs and classes please visit www.anthemstrongfamilies.org.